Breastfeeding is full of nutritional value and health benefits for both the child and mother. However, two thirds of new mothers have trouble breastfeeding or don’t reach their goals of breastfeeding exclusively. By getting advice and assistance early in the process, you greatly increase your chances of success. 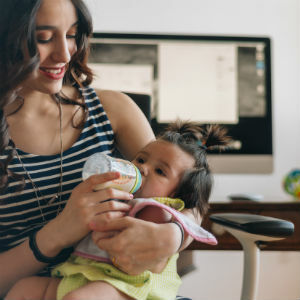 At Woodburn Pediatric Clinic, we offer a broad range of lactation services, which includes everything from teaching a new mother how to position her baby for proper breastfeeding, to handling breast infection or injury. We also devise feeding strategies for mothers with preemies, multiples, or infants with medical conditions such as a heart disorder or cleft palate. It is recommended to breastfeed your infant exclusively for the first six months of life before introducing other foods to complement their breast milk diet. Nursing is safe and the milk contains antibodies to protect infants from common childhood illnesses such as ear infections, respiratory issues, and diarrhea, and can prevent obesity, diabetes, and allergies as your child ages. Breastfeeding also benefits the mother by lowering the risk of breast and ovarian cancer, postpartum depression, and can burn more than 1,000 calories per day. Breastfeeding is a convenient and affordable option to ensure your baby gets adequate nutrition for a lifetime of good health. Whether you are a new mother or months into breastfeeding, let our consultants help create a care plan that works best for you and your baby. We serve a diverse population of patients at our location in Woodburn, Oregon and provide flexible, same-day appointment scheduling. Breastfeeding your baby should be an enjoyable, bonding experience for both mother and baby. At Woodburn Pediatric Clinic, we are here to reassure you and be a parenting resource for any breastfeeding questions or difficulties. Schedule an appointment with a lactation specialist today.